Social media can be time consuming, but it’s also one of the most agile parts of your business. If you’re looking to make up for lost time, social media might be the best place to start. Whether you’re worried about Daylight Savings Time, or just looking for a spare hour, here are some ideas for saving time on social media. Finding great content is time consuming. You have to scour the web for posts that are relevant to your following, read them to ensure their quality, then schedule them them or publish them to your social accounts. Sharing high quality content is essential if you’re to succeed on social media. But does it have to take up so much time? Hootsuite’s Suggested Content feature takes care of most of the work for you. The feature analyzes your posting history on Twitter, then recommends content that meets your interests and those of your followers. You can then read the posts for quality assurance and, if you like them, the suggested content feature will schedule them in prime spots within your publishing calendar. Three steps turned into one means a lot of time saved, most importantly without neglecting your followers or sharing low-quality content. Another way to save yourself time on content discovery is to prompt your users for their content. Many of your social media followers will be active social media users and contributors, finding and sharing content on Twitter, Facebook, Google+ and beyond. They’re often more honed in to the community than you might be. They’re also often happy to see you mention their name. Ask your users to share content that others might find interesting. It could be something they read or something they wrote. You might be surprised at the high quality of content your followers will share. You can then use this content on your own accounts and shout-out the users who shared it, creating goodwill in the process. Another way to use UGC is by hosting simple contests, asking for photos of your product for example, and mentioning the winners in return. This is a great, low-effort way to spice up your Instagram feed or Pinterest page. If you’re trying to save time with social media, bulk scheduling is probably the easiest way to go about it. Bulk scheduling takes a lengthy process and boils it down to its simplest parts. 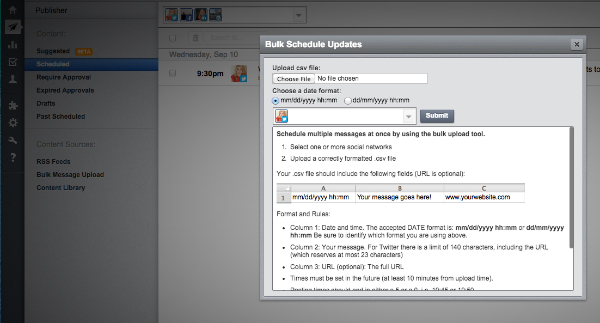 With Hootsuite’s bulk scheduling you can schedule up to 350 messages at the same time. To do so, you need to upload a spreadsheet with the time and content of each post. You still have to write your Tweets and Facebook posts, but you avoid the time-consuming process of typing them in and scheduling them one-by-one. For those who aren’t familiar with it, IFTTT (which stands for If This Then That) is a tool that allows you to complete certain actions automatically. You create recipes where “this” is the trigger action that leads to a subsequent “that” action. From personal experience, I can tell you that IFTTT saves me hours every week. These are just a few of the dozens and dozens of IFTTT social media recipes. If you work in social media, there’s a recipe out there that will save you time and effort. Do you create a new document to write Tweets in every day? Is your social media strategy divvied up into a handful of slide decks and Google docs? This kind of disorganised system is sure to waste your time, day after day. Instead, use templates. There are countless social media templates available online, for everything from image sizes to content calendars. Find them, implement them and don’t stop using them. 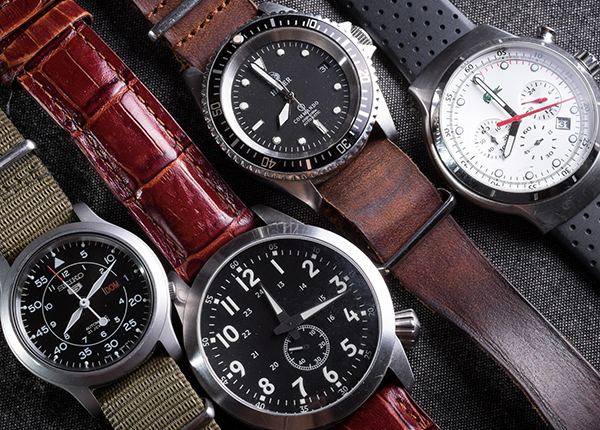 As you get more comfortable with them, you’ll shave minutes—honestly, maybe even hours—off of your day. When you want to send somebody a Tweet, what do you do? Do you search for their name on Twitter, find their handle and copy and paste it into your compose box? If you already know it, do you type it out manually and double check for typos? This is such a minor part of your day, but you’d be surprised at how much time it eats up. 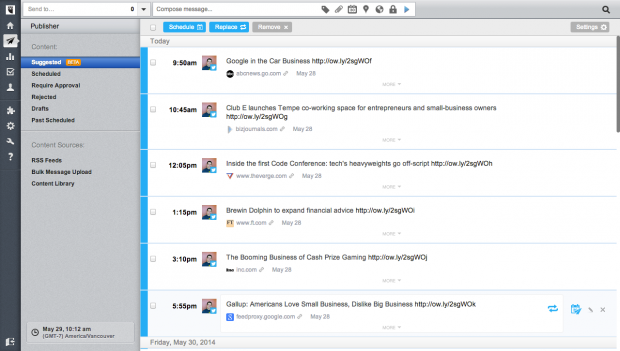 A little know Hootsuite feature can eliminate a few seconds from every message you send. Within Hootsuite, you can actually drag and drop a person’s avatar into the compose box and it will auto-populate the message with their Twitter handle. The drag and drop also works for adding people to Twitter lists. If you have a Hootsuite stream for a specific Twitter list, you can drag a person’s avatar into that stream and they’ll be automatically added to that list. This is far quicker and easier than going through native Twitter to add someone to a list, and even faster than using the Hootsuite drop-down menu. These might seem like menial tasks, but using the drag and drop functionality throughout your day can really add up into valuable time saved. Hosting an account takeover is a marketing play that many brands have tried in the last few years. They let a celebrity or influencer take over their social accounts to attract a new audience and add variety and surprise to their content marketing. For regular businesses, a simple alternative is to let a colleague, maybe someone in a different department, take over you account for an hour or two. You can let you HR team take over and Tweet about job openings or engage with applicants. You might let your developers take over your Facebook page to talk about upcoming releases. Maybe you want your CEO to show his thought leadership by taking over your account and answering follower questions for an hour. An account takeover will still take time. You need to plan it out in advance and train your ‘replacement’ on how to use your social accounts correctly and securely. Still, having someone else actively engaging your followers while you observe passively (and catch-up other work) might just offer up the break you need. Save yourself using Hootsuite. Try it free today.